Quilting Adventures: And the winner is............! Unlike some people I know (I won't mention any names like Sharon) who are so organized when it comes to give away by having the package pre-made, I like to shop for the individual. LOL Well, those I know anyway. Onward to the draw! Here's the cutting of the comments! Ladies if you want to e-mail me your snail mail address, I will get your surprises in the mail. Fun drawing - congrats to your winners. Congrats to the winners and I love that you are a selfish person too. Carry on my friend. LOL!!! Congrats to the winners! WooHoo! Hi Carole: I love that quilt too - such pretty fabrics!! Nice to see that you dropped by my novascotiaquilts.com blog - I seldom get comments there as it is attached to my studio website. Your comments gave me a boost!! Thanks!! Janet in coastal Nova Scotia where another storm is on the way. Seriously, Congratulations to the winners! I think that all of you wonderful quilting, blogging friends are winners!!!! Congrats to Beth and Shelina! 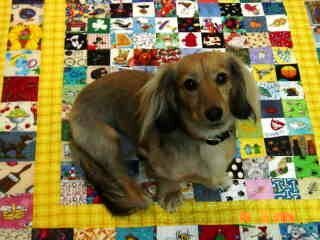 Love your little Darlene quilt too! Blogging does open up the world to new friendships all around the world *s* Congrats to the winners. I am so happy that you are so selfish that you want to send fun mail all over the world. I can´t envy these women as I haven´t even finished reading or using what you sent me a little over a week ago. Thanks again my friend. Congrats to the lucky winners, you're so wonderfully generous!